The Black-capped Chickadee, the state bird of Massachusetts and Maine, is a perky little bird. The quick style of flying, distinctive black and white markings, and chipper song make the Black-capped Chickadee easily recognizable. Black-capped Chickadees are found in neighborhoods and on the edge of forests, parks and other thinly wooded areas. The female Black-capped Chickadee will lay 4-5 eggs (sometimes up to 6) in a nest lined with fur and other soft materials. Black-capped Chickadees eat insects, wild berries and fruit, as well as bird seed and suet from bird feeders. Black-capped Chickadees are easy to spot once you know what you are looking for, and these friendly birds can be found year-round within their range. The average size of a Black-capped Chickadee is just over five inches, and Black-capped Chickadees weigh less than half an ounce. Singing their recognizable "chick-a-dee-dee-dee" song, these birds are easy to find. What these petite birds lack in size, they make up for in enthusiastic singing and intelligence. Flitting to and fro around your yard and neighborhood, these outgoing songbirds are curious and often quite comfortable around people. In winter, with some patience, you can often train these smart little birds to eat right from your hand. You may also notice that Black-capped Chickadees sometimes look different in winter. That’s because in cold weather they will sometimes fluff up their feathers to create additional insulation. Black-capped Chickadees also spend cold winter nights in cavities if they can; sometimes sharing excavated woodpecker holes or tree cavities with other birds. 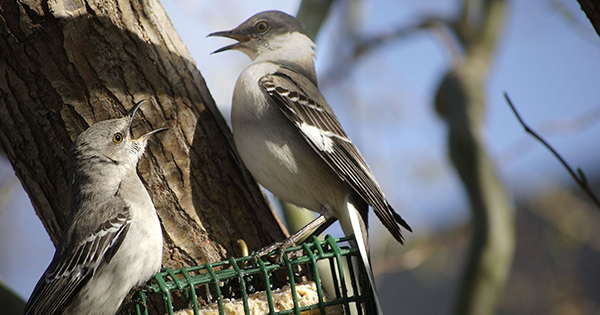 These friendly songbirds often join a flock of mixed birds (except during breeding season), and can be seen traveling with woodpeckers, nuthatches and other chickadees. You'll find Black-capped Chickadees in forests, along the edges of a woodland area, and in parks and neighborhoods across the northern half of the United States. They look for wooded areas, but have also been found living in fields with dense weeds. After spending the winter in mixed flocks, Black-capped Chickadees pair off in spring to make their nests and raise a family. Black-capped Chickadees build their nests in birdhouses, woodpecker holes and other cavities commonly found in dead trees. While a ready-made birdhouse is nice, Black-capped Chickadees are happy to excavate their own hole. They just need a place to start. If you want to encourage a Black-capped Chickadee to nest in an old tree in your yard, you can drill a 1.125 inch hole in the wood between four and fifteen feet off the ground. Once they find it, a pair of Black-capped Chickadees may decide to excavate it for a nest. Black-capped Chickadees often excavate several locations before choosing one in which to build their nest. To improve the chances they will nest in your yard, add wood chips or sawdust to the birdhouse or excavated hole. 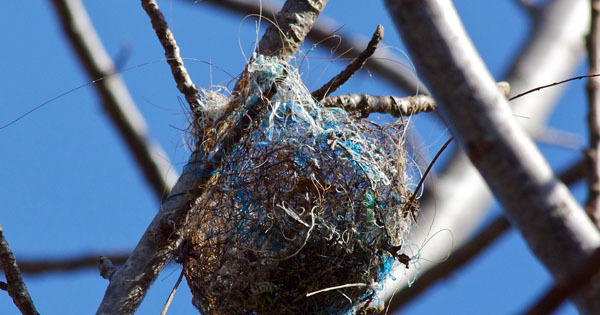 Black-capped Chickadees seem to like this material in their nesting sites. Unlike many other birds that are overly aggressive during mating season, Black-capped Chickadees quietly pair off and begin looking for that ideal location. The male will chase off other competitors that get too close and there is occasional mate feeding, but in general their mating rituals and behavior is more tempered than a lot of other birds. During mating season, you may see the male Black-capped Chickadee feeding the female - a behavior called "mate feeding". The nests of Black-capped Chickadees are made from soft materials including fur from animals, moss or the softer stems of weeds. Once they have chosen a nesting location, it takes four or five days for the pair to build their nest. The female Black-capped Chickadee will lay four or five eggs and she generally stays on the nest incubating the eggs until they hatch. The male will usually bring her food, but she may occasionally leave the nest to forage for her own meal. During this time the male does not incubate the eggs. After twelve to thirteen days, the eggs will hatch and the parents will begin feeding the nestlings real food. Over two weeks will pass before most fledglings leave the nest. During this time they eat primarily caterpillars and other insects that their parents bring to them. Black-capped Chickadees have a diet that is made up of mostly insects, but they are also opportunistic. While they prefer insects, Black-capped Chickadees also eat fruits, berries and a variety of seeds when the weather gets cold (or they find a bird feeder that is well stocked with black oil sunflower seeds or suet). Sometimes referred to as "clinger" birds, Black-capped Chickadees are able to feed upside down on tree branches. 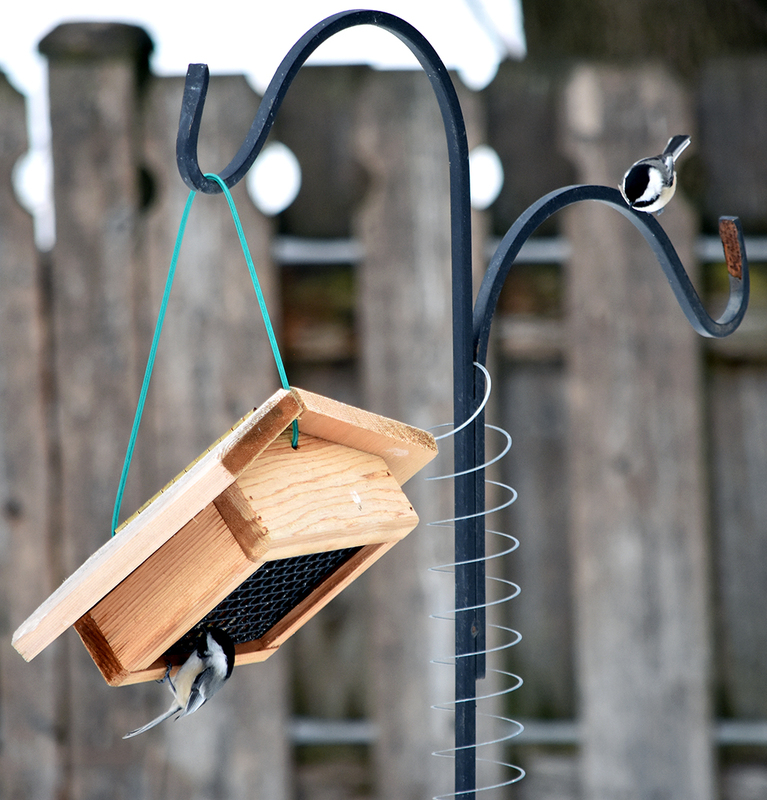 If you really want to attract Black-capped Chickadees to your bird feeders, consider adding an upside down suet feeder. Typically the only birds that will feed at this type of a feeder are Black-capped Chickadees, nuthatches and woodpeckers. 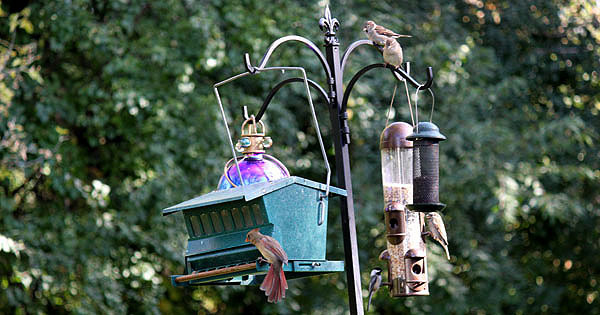 The birds will have less competition at upside down suet feeders than at traditional birdseed feeders. Black-capped Chickadees are known to hoard food, storing it in the crevices of trees until they can eat it later. It’s rare to see Black-capped Chickadees actually eating at a feeder. Instead Black-capped Chickadees energetically fly to and from bird feeders, collecting food for another time. Their easy-to-recognize appearance, outgoing personalities and active presence at bird feeders year round makes Black-capped Chickadees a favorite of backyard bird watchers from Oregon to New Jersey and across the Midwest. Photo Credit: Chickadee eating by brm1949 via Depositphotos.com, Chickadee nesting by Devon via Depositphotos.com, cc. Chickadees at suet feeder by WildAboutBirds.com photographer Judy_NMMI.